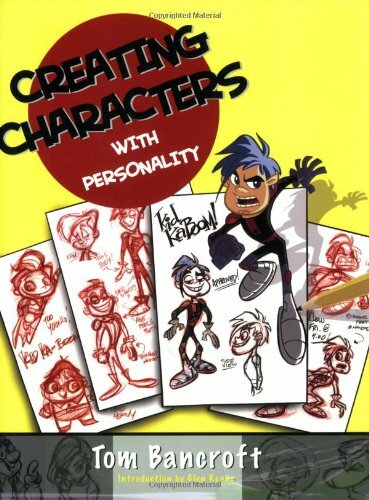 This is a great book on character design, and should be compulsory reading if you draw characters of any sort. It is packed with tips from veteran animator Tom Bancroft who has worked at Disney for 12 years, on films such as Beauty and the Beast, The Lion King, Aladdin, Pochantas, Mulan, Tarzan and a few others. The tips are short but effective. The topics are on creating unique shapes for your characters, posing, exploring facial features and how they work, iterating through different styles, and understanding the other more subtle areas of character designs like aging, using costumes and colours. You can use any tip and improve your character instantly. There are lots of illustrated examples that show you how it's done, and insightful explanation on why they are done a certain way. The commentary is illuminating. After reading the book, you'll be able to look at your characters from a new perspective, and for any animated films you watch, you'll be able to get an idea on the kind of the design choices that were made to the characters. Also included in the book are simple assignments you can try out. Tom Bancroft has also invited several guest artists to work on those assignments also. You can see the character designs from each artist, and also understand from the commentary how they were created. This is an insightful and helpful book for anyone who draws characters. Highly recommended. Hey Parka by any chance did you pick up Character Mentor? And would you recommend it? I'll review Character Mentor next day or so. That book is sort of like an example book for this book.